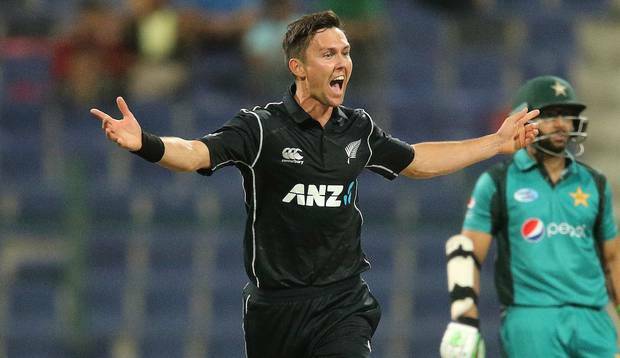 The Black Caps needed something special to get their season on track, and Trent Boult had just the trick. After suffering a 3-0 series defeat in the Twenty20 series, it was a return to a favoured format for the Black Caps, who have now 12 straight ODIs against Pakistan – a winning streak that stretches back to 2014. The victory doubles as the first win under new coach Gary Stead, and he had a slice of history accompanying it, with Boult joining Shane Bond (against Australia in 2007) and Danny Morrison (v India in 1994) as the only Kiwis to claim an ODI hat-trick. "It's my third hat-trick ever I reckon, and the other two I got were in the same game against Whakatane back in 2002," laughed Boult. Hafeez came out to face the hat-trick ball, and was promptly trapped lbw by an inswinger, and up went the umpire's finger to scenes of celebration amongst the Black Caps players.